So in my last post I mentioned that we were going to continue with trying to figure out our small issues of the chair controller dumping and continue to attempt to use the joystick as an interrupt in order to allow the joystick to be used. Well I got a little side tracked by a new device I ordered and started to play with that. So we are going to make a quick post on that. This is part three of the hacking of the wheel chair. 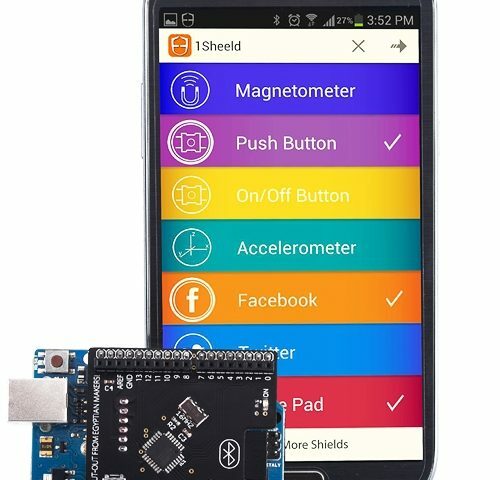 I purchased the 1Sheeld which is an amazing little shield that connects to your smart phone and uses all of the sensors of that. Yes its a bit of a cheater method but I figured it would be nice to have another method of control. Right now I am only using the game pad function, later I plan to use the slide music player and a few other options from the phone. I have a few small gripes about the 1sheeld but I am pleased with the results thus far. Look for my review of the 1Sheeld for more on that. Using the same RC circuit from the first rendition of this project and the Arduino Uno I hooked up the 1Sheeld. Using the same pins I changed the code around a bit and the functions within the code. It was so easy to get the chair running from the Arduino using this. Forward, back, left, right all function great. This little thing is allowing me to check my ratio on the motors easier to make it run straight. Now I saw a note on the 1sheeld that said something about ” but lacks capability query, analog, I2C and servos messages.” so I am a little concerned about using the joystick with this but hopefully all will go well.